A well-designed landscape can be the most relaxing place on earth, especially after a hard day at work. However, few of us want to spend the energy or time needed on mowing, pruning, and other chores to keep our lawns looking great. For those of us who don’t want to spend the upcoming spring behind a mower, there’s low maintenance landscaping. One of the best ways to keep the mower in the garage: Don’t have a lot of grass. Groundcover can give you more color and texture options, create areas that look more appealing than turf grass — and can reduce your overall workload in the process. We recommend ornamental grasses. Blue fescue and ajuga are “grasses” and don’t require any mowing. This strategy means liberal use of mulch, which helps keep the weeds at bay and conditions your soil for more productive planting in the future. Another key feature of a low-maintenance design is simplicity and its most important component may be plant selection. This is because some plants just need more maintenance than others. Be choosy and select plants with moderate growth rates, few pest problems and no messy fruits, pods, seeds, or shedding branches to clean up. Butterfly bushes can cover a lot of ground and require very little pruning. Contoneaster is a multi-season plant that spreads out and gives you white flowers in the summer and red berries in the fall. It doesn’t just kill space; it’s visually interesting. 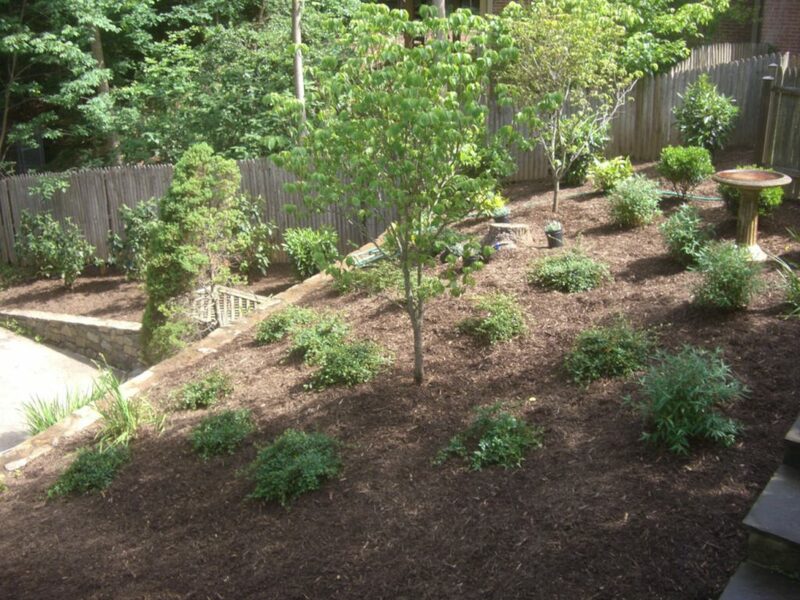 Trees give your landscaping a focal point that alleviates the need to add other flourishes. Occasional pruning may be required, but on the whole, trees need a lot less hand-holding than most other forms of landscaping. Plus they look good with simple rings of mulch, with or without paver edges, adding more landscaping space that you won’t have to think about. River birch works well in our wet climate and is resistant to borers. It’s one of the most resilient trees you can pick. You also can’t go wrong with a white oak. You’ll want to avoid pine trees if you want a low maintenance landscape. Contact us today to meet with a designer so they can go over your specific needs. Our designers will work with you to create that beautiful, relaxing and low maintenance landscape you’ve always wanted.